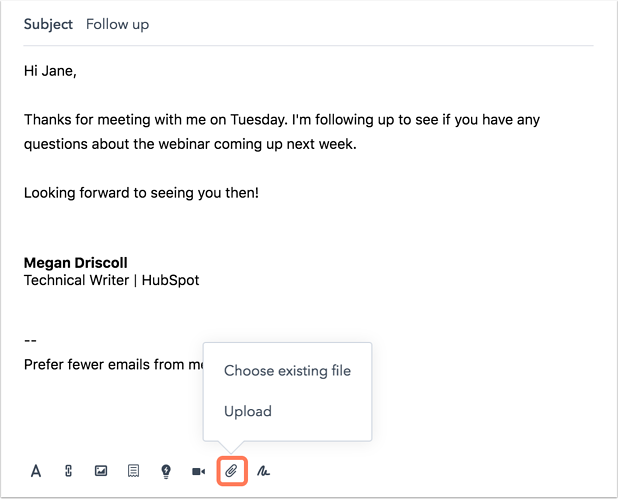 Add document attachments to one-to-one sales emails in HubSpot. Currently, HubSpot marketing emails cannot have attachments, but you can include a link to a file. To improve deliverability and email load times, you can't add attachments to HubSpot marketing emails. Instead, you can upload your file to your file manager and link to the file URL. You can also use a CTA to link directly to the file URL. Click the name of an existing draft email or create a new email. Select the text or image to link to your file. Click the link to file iconlin file in the rich text toolbar. In the right slide-in panel, use the search bar to locate your file, or click the Add file dropdown menu to upload a new file. Your linked text will now load the document for your email recipient. You can attach files in one-to-one sales emails sent from a record in your CRM. You can also attach a document to a sales email template using the documents tool. Please note: there's a file size limit of 10 MB for files attached to sales emails. Click the name of the contact you want to email. Click the Email tab at the top of the contact record. Compose your email and click attach to attach a file. Select Upload to select a file from your computer or select Choose existing file to attach a file from your file manager.